A wonderful heirloom with reliably double flowers in a golden yellow hue. Watch hummingbirds dip their bills into the wide ring of florets in the center of each flower, their wings whirring! Pick often for bouquets. 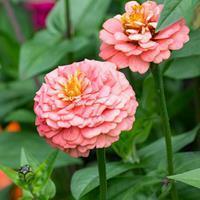 As with all large zinnias, space 2.5’ apart for good air circulation to keep healthy. Crested types (also called scabiosa flowered) were available around 1930, but not fixed, so many off-types were found. Ours is an improved collection, having petals of scarlet, violet, gold and pink, all with gumdrop centers. 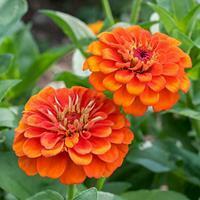 Inca has arresting orange flowers filled with petals that twist and curl in and catch the summer sun. Reliably double, it is a tall, strong-stemmed beauty, perfect for bouquets. A beautiful soft cream-yellow zinnia reintroduced in 1955 as seed once again became available, this heirloom zinnia is an elegant addition to borders of pastel-hued flowers, or for the white garden. Excellent cut, expect fully double to single blooms. A kaleidoscope of color and pattern in yellow, cream, chestnut and rosy red add sparkle to bouquets and edge garden beds with billowing flower-filled abandon. 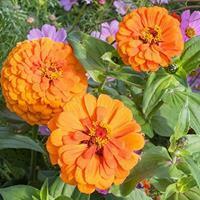 The 1 1/2” wide flowers are easy to grow with clean, bright green foliage. Zinnia 'Luminosa' was listed in catalogs as early as 1933, where it was described as "charming deep pink suffused with salmon." A great addition to any heirloom cut flower garden. Lovely yellow and cherry pink flowers with a band of hot pink make this new variety an absolute knockout! Easy to grow and compact, it will be the star of summer bouquets. A flower arranger's delight, 'Mazurkia' has a myriad overlapping blunt-tipped petals of cream and cherry rose. Early to flower with improved doubleness over other similar types, it has a neat compact habit. Keep well watered, watering mornings only and fertilize twice during season. Butterflies flutter about these zinnias on sunny summer days, all the more reason to plant in large drifts. A very mildew resistant variety, the lollipop colors of 'Oklahoma' are found on 2" wide flowers on a tall, branching plant. Easy and lovely! A warm hue and a great performer, this variety is part of the prolific, disease resistant Oklahoma Mix that we love for cut flowers. We pick and pick and they still keep coming! Dark green foliage, strong stems and a good flower size (1.5-2”) for mixed bouquets adds to their charms. 'Oriole' has bright glistening orange flowers shaded with gold. A classic dahlia-flowered zinnia from the 1920s, still as lovely today. The sturdy stems make them ideal for cut flowers. Heralded as one of 1954's "Flowers of Exceptional Merit" in the Olds Seed catalog, this vintage variety offers neat flowers in stripes of scarlet red, rose, orange and violet on a ground of cream, white, pink, or yellow. Cut often for bouquets, they bloom all summer until frost. A long-stemmed heirloom favorite with snow white flowers accented with gold stamens in the center of the blooms. 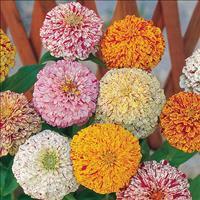 Pure white double zinnias have been listed in seed catalogs since the 1870s. A brand new offering from a venerable French seed house, with ripe cherry red and white layered petticoat petals. A standout in the garden, disease resistant and so easy to grow, just provide regular water until established, then it will withstand dry weather admirably. A 2014 Fleuroselect Novelty. 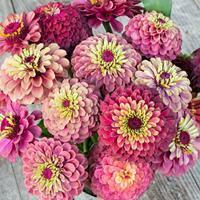 Large flowers of rich wine-purple grace this heirloom selection of dahlia flowered zinnia. Recommended in a 1949 flower book, today it looks spectacular combined with our 'Lime Green' tobacco. One of our favorite zinnias this year, new ‘Queeny Orange’ has a bevy of reliably double 2.5” blooms held on branching stems that keep on producing flowers all summer long. Ideal as a cut flower its rich orange color glows like molten lava! Healthy foliage looks good all season too. A winner! This sophisticated variety will be the star of your cutting garden! An unexpected beauty, it has seemingly endless combinations of lime, mauve and rose in fully double flowers. A perfect choice for beautiful bouquets all summer. A 2007 Fleuroselect Novelty Zinnia 'Queen Red Lime'. A delicious looking flower with elegant green petals and prominent raspberry pink centers. A perfect flower for summery bouquets, paired with pink cosmos and feathery celosia. A 2016 Fleuroselect Novelty, Zinnia 'Queeny Lime with Blotch'.